I have had an affinity for tank games since my childhood. Super Tank was my favorite game among all the games for which I had cassettes for. Nowadays, however, the level of tank games has grown multifold and you can find these games of most of the gaming platforms consisting both consoles and handheld smart devices. 2-3 months back I shifted to Android ecosystem after being loyal to Windows smartphones for a long time and soon enough I was searching for a good tank game which I can enjoy with other real players. Since then I have found some gems and many other duds. The common features among these games were fuel dependent gameplay which means you have to wait for fuel to replenish before going on to play another game, upgrade capabilities and quite similar power-ups like increasing load rate, damage power, and armor repair. Below I am going to share with you the few gems I was able to find in Multiplayer Tank games niche which you can yourself play and enjoy. War Machines is my favorite on the list I am sharing in this article. With great graphics, multiple customization options, tournaments, an active community and fighting as part of a team gives you probably everything that you can desire in a multiplayer tank game. The game has a great algorithm which will place you against tanks that give you a level playing field with a few of the tanks more powerful than you and a few weaker than you. As you progress you can keep buying new tanks, upgrade their parts which will improve their attack, defense, run and reload speed. You can join a clan and be a part of tournaments where the complete team contributes to getting more number of kills than their opponents. The awards of winning boxes which give you power-ups like shields, nitro, health restore etc, which you can use in the game. There are two types of currency in the game - Gold and Diamonds. Both can be collected inside the game as well as from the boxes and is required to buy new tanks as well as to upgrade it. 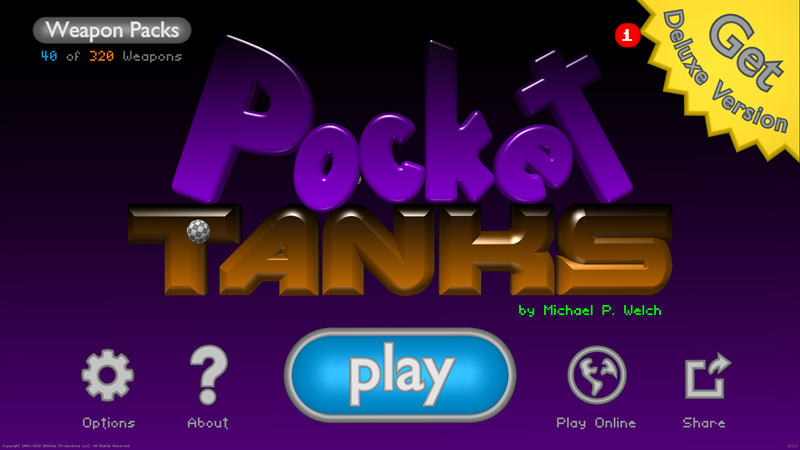 There is limited fuel available for the tank which makes sure that you don't endlessly keep on playing. Each match requires 3 fuel cells and you get a total of 9 cells with each cell taking 10 minutes to replenish. There are in-app purchases to give you more edge in the matches and if you feel like you can go for those. 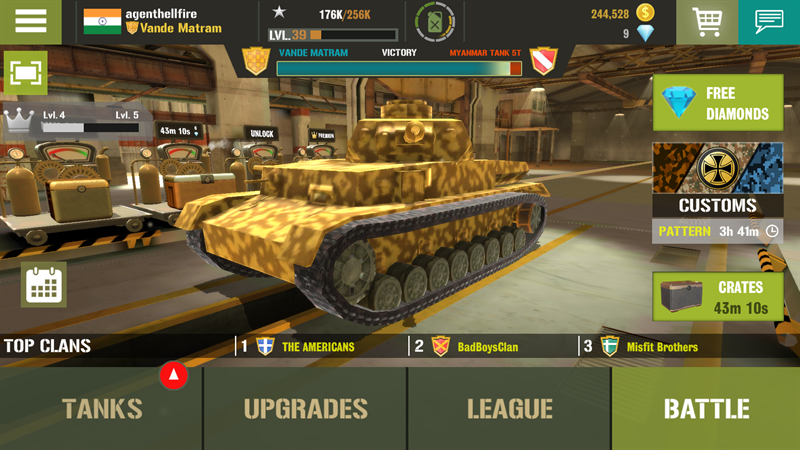 If you do have a good internet connection and your phone RAM is able to handle the load of the game then War Machines is a highly recommended tank game for you. This is a famous PC game that many of us would have played sometime. You can play this game with the computer or with your friend using the same mobile or on Wifi. You can also play it players around the world using the Online game mode. In case you don't know about the game, the match is between you and another player you are located on two sides of a hill. You can move, set the coordinates of your canon and set the firing speed. There are different types of bullets like the ping pong ball, three shots, one shot, etc, which explode and perform different types of attacks. These bullets have to be selected at the start of the game. Once the bullets are spent depending on the side which has made the maximum damage wins the match. 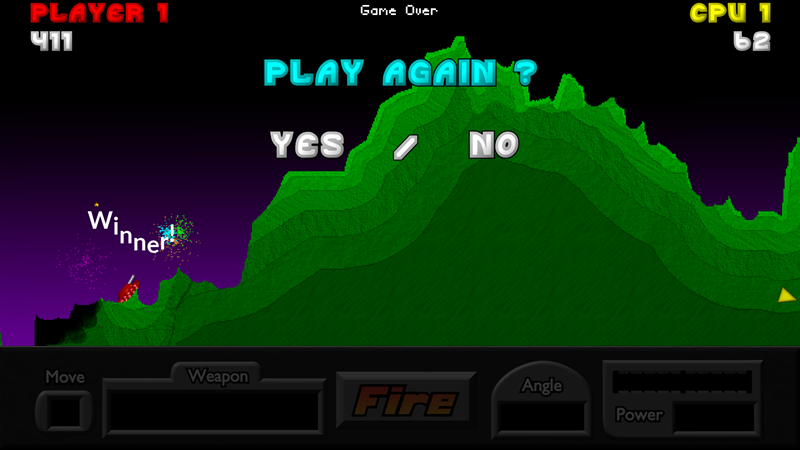 Pocket Tanks is a light game with very basic graphics and straightforward gameplay. It takes little time to get the hang of the game and once you are done you are ready to compete with other players online. In addition to the 40 bullet packs available, there are 280 more that you can buy using real money. That is the only upgrade that you can do in the game, there are no virtual coins, energy, diamonds or powerful tanks to upgrade to. The motive of the developers is quite clear here to keep the game as close to its original form as possible. This is not a game you get too addicted to, but it is definitely a game that you want to play when you are bored and have nothing better to do. 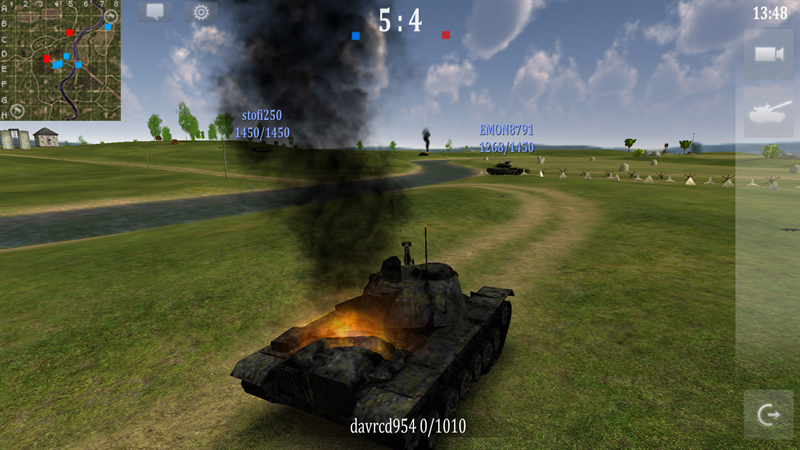 Armored Aces is a 3D tank based multiplayer game where you select the World War 2 or Modern World themed tanks. There are multiple battlegrounds where you are divided into a team of 6-6 to fight each other and capture flags of the opposite team. You can upgrade your tank capabilities and buy new tanks. There is a voice assistant in the game which will alert you when enemies are spotted when your tank armor is in critical condition and in some more situations. The game mechanics to move the tank are not that good compared to other tank games. The pivoting gun turret stays in the same direction even when you are moving the body of the tank. It means you have to constantly realign the turret wasting precious time. The ideal way, like in other games is to keep the turret aligned with the rest of the tank body movement and have a separate turret movement control for when you want to aim. Iron Force is another one of my favorites after War Machines. The gameplay is quite same with initial Free For All games where everyone is your enemy and then as you rank above you can participate in tournaments and join Legions (clans) to compete as part of a team. The tank visual is little small compared to War Machines and Armored Aces but that is not necessary a bad thing. 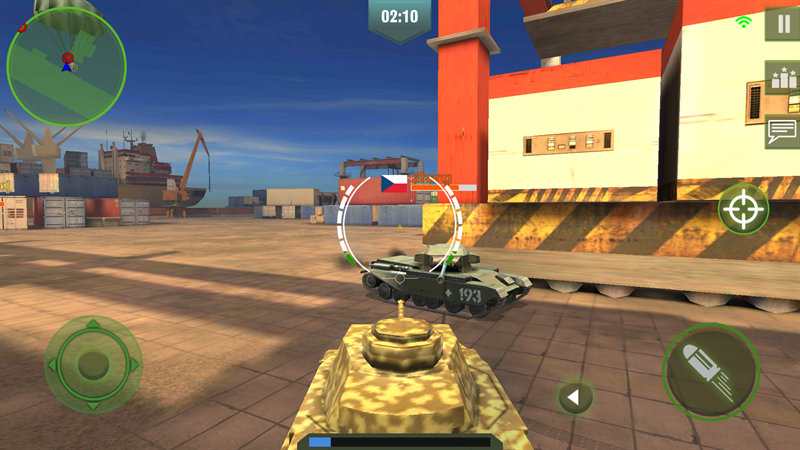 The game dynamics differ in many areas like the crosshairs turning to red indicating a potential positive hit which is absent in War Machines and also the critical hit in Iron Force is in the middle of the tank rather than at the back area. The maps will keep opening up as you level up.The controls are easy to handle and don't take much time getting used to. Each damage hit on the armor is highlighted with the shot direction so that you can maneuver accordingly. You also have Technology upgrades in Iron Force which are something unique to Iron Force and therefore offer something new on the block. You can also get new blueprints from the field by getting the crates. 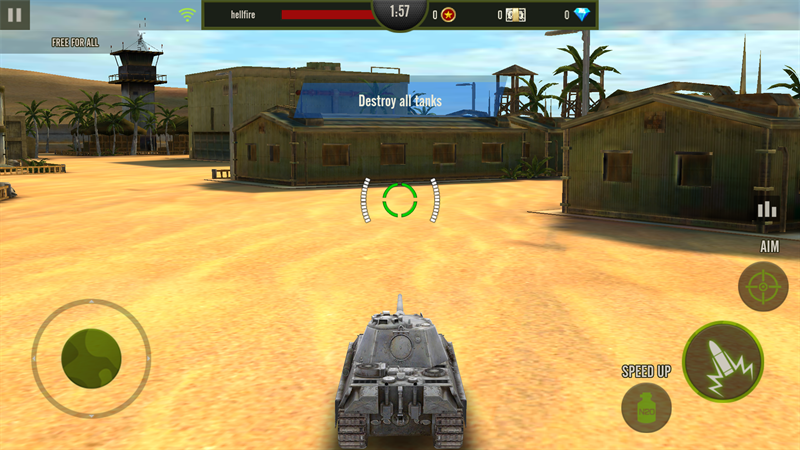 Multiplayer tank games presently there for Android have similar base level gameplays with various maps, Free for All/Team based matches, similar power-ups which boost damage, repair armor or increase speed and on the other hand have tried to keep them distinct by putting a few of the enhancements in form of permanent upgrades or as power-ups which can be selected before the game or can be taken during the battle itself. This gameplay is probably a result of the long history of likes and dislikes that the developers have researched from the player's feedback. Much of what you would want in these games is present in the above-mentioned games and as for my personal favorites, they are definitely War Machines and Iron Force. There are many more similar games out there but some look like cheap copies and some have game dynamics which just frustrate you and make you uninstall the game. I hope you like the list I have made for Android Multiplayer Tank games and if you do think that there is another such game which deserved to be in this please do mention it in the comments below.